Confession: I’ve eaten hummus with a spoon. And while I’m at it, I’ve also eaten black beans right out of the can. 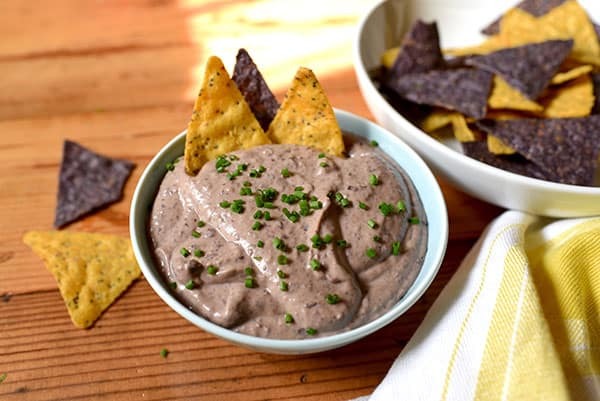 I’m admitting these things because this is a safe space, but mainly because we’ve got a delicious recipe that combines these two wholesome foods: black bean hummus. Hummus should be a staple in any healthy household: Its smooth, creamy consistency and flavorful goodness make it a nourishing alternative to condiments like cream cheese or mayo. 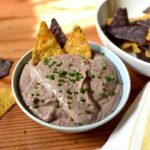 You can make hummus in many variations, including avocado, white bean and roasted bell pepper, and now, this black bean version! Black beans have a soft, yet hearty consistency that blends well with lemon juice, garlic, and tahini to create a savory spread that’s lower in calories and fat and contains much more fiber than its chickpea-centric cousin. Bonus: Throw all the ingredients in a food processor, blend and eat. No actual cooking required. Easy, chick-peasy! Given the carb content of beans, we suggest serving this rich black bean hummus with vegetables such as celery, bell pepper, or jicama, or use it as a sauce for a lettuce-wrapped sandwich. This creamy, spreadable Black Bean Hummus is made with tangy tahini, savory black beans, fresh lemon juice, and a touch of cayenne pepper. Place beans, broth, tahini, garlic, and lemon juice in food processor (or blender). Pulse until smooth. If hummus is too thick add 1 Tbsp. reserved liquid at a time until hummus is desired consistency. Season with salt and cayenne pepper if desired. Refrigerate 1 to 2 hours to allow the flavors to blend. An FFC as part of breakfast, lunch or a snack(tional).